Scolisev in game: 5,302 Who? Important notice! Pokemon Scolisev is a fictional character of humans. 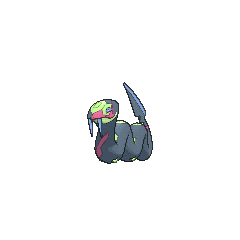 Seviper (Japanese: ハブネーク Habunake) is a Poison-type Pokémon introduced in Generation III. It is well known for its ongoing feud against Zangoose. 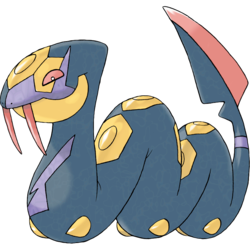 Seviper is a serpentine Pokémon that is usually depicted scrunched up like an accordion. It is mostly black, but has several markings on its body. It has yellow hexagon markings that run from its head to its tail, small yellow bumps where it touches the ground, and various purple scar-like marks. It has elongated red fangs that protrude from its upper jaw and fierce red eyes. Its tail is partially red and has a blade-like shape. Seviper sharpens its tail on rocks, and can use it for its former signature move, Poison Tail. Seviper wraps around its opponents to make them unable to move. Its tail and fangs are venomous, and are used for striking and poisoning prey or enemies. It has been bitter enemies with Zangoose for many generations. It lives in grassy areas. Seviper first appeared in A Tail with a Twist. Jessie was so impressed by how it beat up Ash's Treecko, that she had to capture it. After it bit off a chunk of her hair accidentally, she beat it up with her own two hands. After James and Meowth calmed her back down, she captured it in a Poké Ball. The Battle Pike Queen Lucy owns a Seviper. She used it to fight off Team Rocket and to battle Ash's Donphan in Queen of the Serpentine. 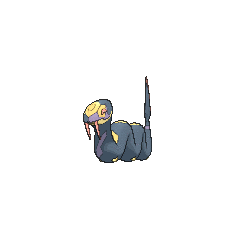 A Seviper appeared in Saving Braviary! under the ownership of a Team Plasma Grunt named Schwarz. Multiple Seviper appeared in Defending the Homeland!. They are one of Florges's minions who orders them to attack Goodra's homeland. Two of them reappeared in Beyond the Rainbow!, Master Class is in Session!, and Till We Compete Again!. A Seviper appeared in a flashback in Good Friends, Great Training!. AG008 Seviper Ash's Pokédex Seviper, the Fang Snake Pokémon. 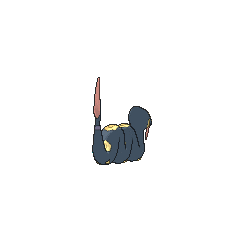 Seviper is known for its angry disposition, immobilizing its opponents by wrapping its body around them. AG048 Seviper Nicholai's Pokédex Seviper, the Fang Snake Pokémon. Seviper shares a generations-long feud with Zangoose. Its sword-like tail can slash foes and douse them with poison. A wild Seviper attacked Ruby and Sapphire after the latter took him to her Secret Base. Her Torchic was able to put it down for the time being with its Ember barrage, but it rose back up after Sapphire fainted from an earlier wound. Ruby, seeing that there was no one around to see him fight, knocked it out cold before leaving Sapphire a letter and a change of clothes. Another Seviper appeared in the wild in On the Loose and Hyper with Zangoose and Seviper I and On the Loose and Hyper with Zangoose and Seviper II where it broke Ruby's Poké Balls in unison with a wild Zangoose. The then-uncaptured Feefee was able to take them both out, resulting in it being forced into his team (which provided a sharp contrast between the well-groomed Nana and Kiki, and Mumu and itself). As in the games, the Pike Queen Lucy uses a Seviper as her main Pokémon, which was able to defeat two rental Pokémon in an exhibition match, and later fought Emerald before losing. Lucy used a Seviper during her battle with Enta. Seviper shares a generations-long feud with Zangoose. The scars on its body are evidence of vicious battles. This Pokémon attacks using its sword-edged tail. Seviper's swordlike tail serves two purposes - it slashes foes and douses them with secreted poison. This Pokémon will not give up its long-running blood feud with Zangoose. Seviper and Zangoose are eternal rivals. It counters a Zangoose's dazzling agility with its swordlike tail, which also oozes a horrible poison. It sharpens its swordlike tail on hard rocks. It hides in tall grass and strikes unwary prey with venomous fangs. For many generations, it has feuded with Zangoose. It whets its bladed tail on rocks for battle. In battle, it uses its bladed tail to counter any Zangoose. It secretes a deadly venom in its tail. Constant polishing makes the edge of the blade on its tail extremely sharp. It's Zangoose's archrival. Seviper’s swordlike tail serves two purposes—it slashes foes and douses them with secreted poison. This Pokémon will not give up its long-running blood feud with Zangoose. Vehicle Gallery: Slithering Trains, Entranceway: A Fateful Showdown! Moves marked with a superscript game abbreviation can only be bred onto Seviper in that game. 51%-100% HP Go with Zangoose? Sorry, I don't do that! 26%-50% HP Shoot... My health's been cut to half already? Level up There, I leveled up! I hate losing to Zangoose! For other sprites and images, please see Seviper images on the Bulbagarden Archives. In an infamous Pokémon Trainer's Choice, Seviper was incorrectly claimed to be an evolution of Arbok. Seviper and its rival Zangoose share several characteristics, such as being in the Field Egg Group, residing in the same Friend Area, and being the only two Pokémon with a base stat total of 458. Seviper and Zangoose also have the exact opposite Experience group, with Seviper being in the Fluctuating group and Zangoose being in the Erratic group. 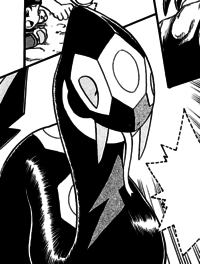 Seviper is the only pure Poison type to not have an evolutionary relative. Seviper is based on a viper; specifically, the habu, a type of venomous snake that was often pitted against mongooses in roadside shows. This practice is now considered inhumane and is rarely seen today. Aside from its scars, the shape of its color pattern resembles that of the elegant pitviper. The rivalry it shares with Zangoose is based on the relationship between mongooses and snakes. Seviper is a combination of sever (to cut and detach) or severe (intense) and viper. Habunake is a combination of 波布 habu and snake. Mandarin Chinese 飯匙蛇 / 饭匙蛇 Fànchí​shé Means "Spoon-shaped snake"